Spots and pimples can not only be painful but can also affect the confidence of teenagers and adults, and men and women alike. 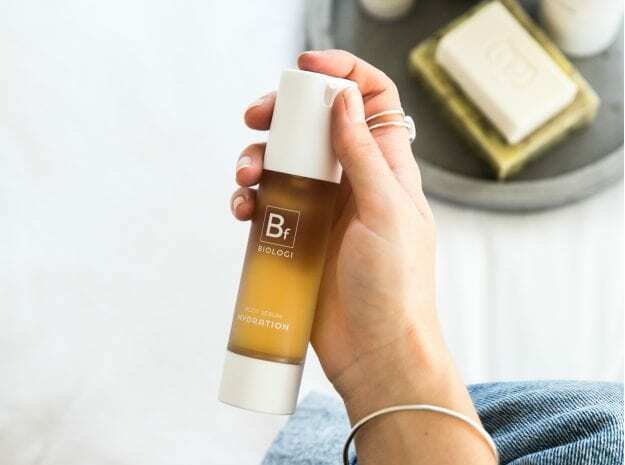 While foundation and concealers can, for the most part, cover up spots and pimples, what we all really want is a smooth complexion on a freshly cleansed face, and we’re here to tell you how to get rid of breakouts…the Biologi way! There are lots of old wives’ tales surrounding the reasons we get spots. Not washing your face properly. Washing your face too much. Eating chocolate. Not eating chocolate. The truth is, while there are many environmental factors that may increase or decrease the severity of your spots once they appear, the breakout forms much further down than the surface of the skin and often up to two weeks before the spot becomes visible. Spots are formed in each individual pore of your skin in a little-known area called the sebaceous gland. In this follicle, sebum – the natural oil that hydrates skin and stops it from drying out – is produced. In a perfect world, skin cells grow, die, shed and replace in perfect harmony with the production of sebum. But it doesn’t take much to offset this natural process. Skin cells may shed too quickly, or not quickly enough. Or too much sebum may be produced in too high a quantity. When these imbalances occur, as they do often, the skin and sebum bond together and clog up the skin pores. Bacteria then becomes trapped in the pores and the body’s natural defence processes kick in and respond by attacking the unwelcome germs causing redness, irritation, and blemishes that appear as visible spots and pimples on your face and body. While the cause of spots starts way beneath the visible layers of skin, there are some environmental factors that can impact the frequency and severity of breakouts. Prolonged periods of stress cause an excess in the release of cortisol, the hormone that helps your body respond to threats of danger. Excess cortisol can stimulate the over-production of sebum which encourages bacteria and activates the body’s anti-inflammatory response in the form of redness, boils, and pimples. Food intolerances including (but not limited to) dairy can also cause breakouts. When the body is invaded with food it can’t process, the skin can go into overdrive to remove the foreign body resulting in excess oil production which is an inviting environment for bacteria. While more common in women, hormonal changes and imbalances for both genders can lead to an excess of sebum production. This can cause the pores to become clogged, and boils and spots to appear on the surface of the skin as bacteria becomes trapped in the follicles. Some people produce more sebum than is needed and results in oiler skin more prone to attracting bacteria. It seems ironic to us that the products meant to help your skin are the very ones that can cause the problems. Synthetic ingredients and harmful chemicals added to moisturisers and cleansers can cause irritation as the skin works harder to expel the harsh chemicals from the body. The ingredients in your skincare are just as important as the ingredients in your food and to keep your skin blemish-free it’s important that you understand exactly what you’re applying topically and how it impacts your body’s natural processes. At Biologi, we believe in tackling the cause of the problem, not just the symptoms. To get rid of breakouts, firstly you must solve the existing problem by healing spots and blemishes, and then you must work to prevent future breakouts. And here’s how Biologi products do both, simultaneously! Kakadu Plum is rich in antioxidants that work to flush out toxins before they get trapped in the pores. Working from the surface and penetrating deep within, the antioxidants clear the pimple-causing bacteria that causes the often unsightly reaction. Kakadu Plum contains healing phytochemicals, which have anti-carcinogenic, anti-fungal, antiviral and anti-inflammatory properties. While Bk Rejuvenating Eye Serum is recommended primarily as an eye serum, apply to your spot-prone areas to cleanse and reduce visible signs of pimples faster. Every bottle of Bk contains natural vitamin C which prevents blemishes and increases your skin’s natural healing process by reducing the inflammation that displays itself in redness and swelling. Keratinization is the process that forms a barrier that holds dead skin cells together with a glue-like substance. When applied topically, Finger Lime extract interrupts this process reducing the oil build-up that leads to acne and other blemishes. Finger Lime seeds are rich in anti-bacterial and anti-inflammatory properties that help to heal acne scars and reduce the redness of existing spots and blemishes. Davidson Plum balances the skins natural oil production by gently cleansing away excess sebum that can cause the skin to become too oily. Davidson Plum is abundant in antioxidants and phenolic acids which are anti-inflammatory and work to heal wounds and repair scarring from acne and aggressive blemishes and spots. Tartaric Acid found in Davidson Plum also contains anti-acne actives which reduce redness and clear pores. Regardless of your skin type and how prone you are to breakouts; your skin is continually changing so you must always be proactive to prevent breakouts. When you use Biologi daily, over time, the healing and preventative properties of our extracts will help to get rid of breakouts both in frequency and severity.